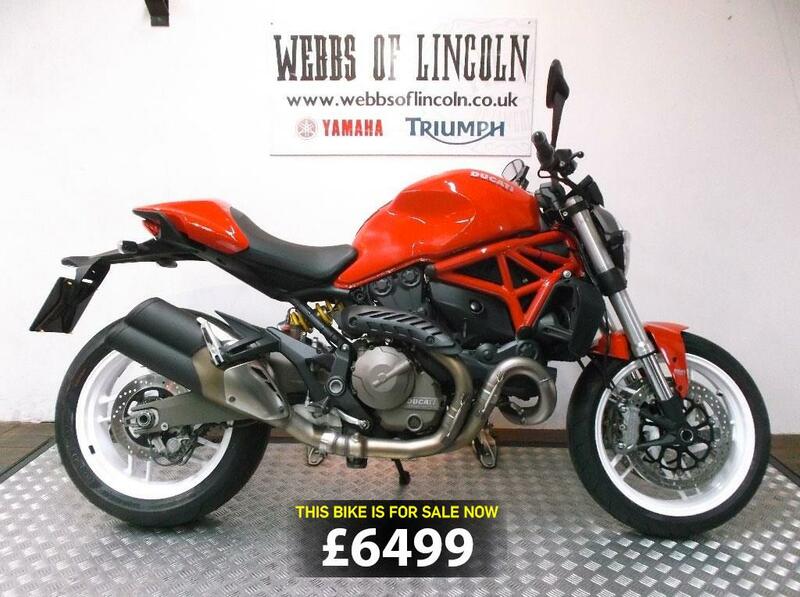 Today's bike of the day is this 2015 Ducati Monster 821. "First registered by Ducati on 15th March 2015 on a '15 plate. Then sold to a local lady owner as of October 2015 who has shown this Monster who's boss traveling around the UK and abroad! So a bike that's not just been used for short local rides. Backed up by a great service record showing 4 dealer stamps in her genuine service book. Offering full book pack and keys, data-tag certificate, log book and HPI. With a pair of stunning newly powder coated white wheels (commissioned by ourselves) and fitted with new brake discs and pads. Also fitted with Oxford heated grips, tank pad and rear seat cowl." "The Monster 821 might not quite be the flagship Monster but it's manageable, eay to ride, has a good turn of speed and good handling too. They're expensive new but second hand they're good value."